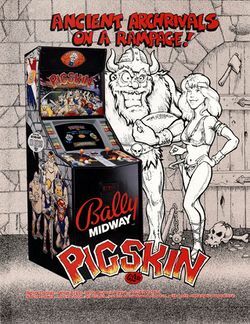 Pigskin 621 AD (fully titled as Pigskin 621 AD: Ancient Archrivals on a Rampage) is an American football arcade game that was released by Midway in 1990; it was the last game to run on their MCR-68 hardware (with the added Yamaha YM-2151 and HC-55516), and the full title is a reference to two of designers Jeff Nauman and Brian Colin's earlier games, Arch Rivals (1989), and Rampage (1986). 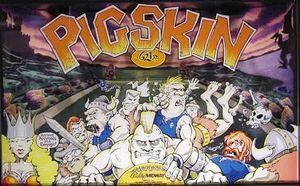 621 was also the number used by Konami for Mr. Goemon (also 1986) but it has no connection to it - and it was later converted to the Sega Genesis, under the title Jerry Glanville's Pigskin Footbrawl. This page was last edited on 29 October 2014, at 20:00.